The Reagan branch I think I'm descended from (see scenario) came to Texas from Tennessee by way of Missouri. They arrived in Cass County, the area where Paris, Texas, is today. 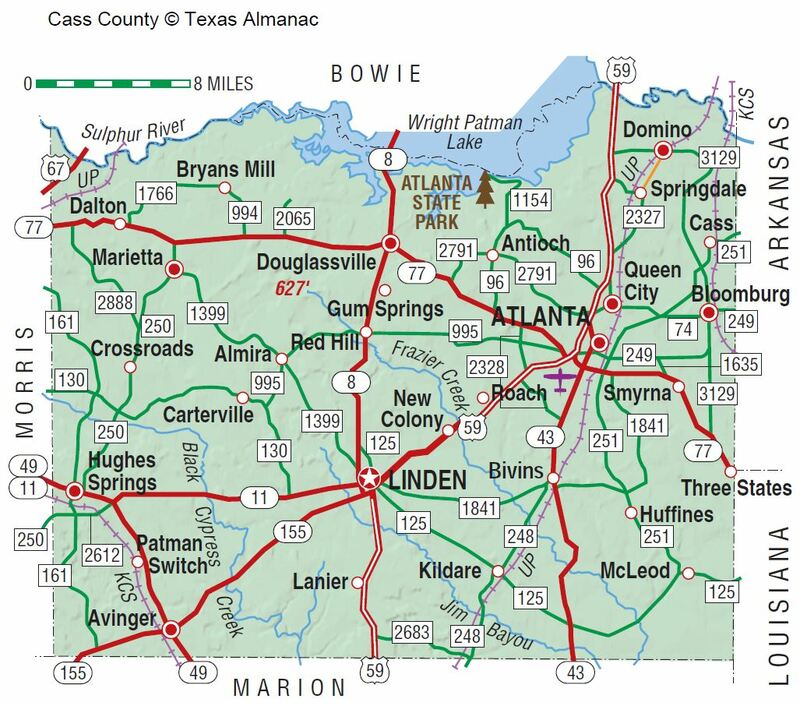 Cass was formed from Bowie in 1846. Supposedly there were also some Ragans in Titus county which joined Cass, as well as Robertson County and Harrison. The family of Joseph Black Reagan (Ahimaaz's son) shows up in the 1850 census of Cass County. He's a 41-year-old farmer born in Tennessee. Wife Jane, 38, and children: Abraham, 14, Mary Ann, 11, Charles, 9, William A., 6, and Thomas B., 3. Abraham is born in Alabama, Mary Ann in Missouri and the rest in Texas, so you can see their migration timeframe. Harrison Reagan (brother to Joseph Black Reagan) was age 47 in the 1850 census of Cass County. In his family: Jane, 43F, James 18M, Joseph 14M, W.A. 16F, P.E. 12F, P.Y. 8M and W.A. 1M. I have a note that John Black Reagan (1802-1854) married Jane Menasco (1806-1886) and they had William A. Reagan who was born in 1844 and died May 29, 1854 in Hunt County, Texas. Jane Menasco shows up first as Harrison Reagan's wife (above) in 1825. This is probably a case of my notes being mixed up, and I don't doubt it given the confusing nature of all the J. Black Reagans.